Ah, summer… The scent of sun protection cream, the salt in the hair that makes it so fuzzy and pretty to style, the naps at 4pm in the afternoon, the endless meaningful talks with your closest friends… Summer… If only it could be summer all year long. Actually for some lucky folks (I am talking about you L.A people!!!) it does seem to be just like that all year long. What a luxury. It’s perhaps one of the reasons why we are planning to move to California, just saying. Sun simply sets me in a great mood. It makes me want to be super active and spend the days out instead of the office. Now we do discuss summer, but beach gave me this season newer challenges. It’s been a while since I actually spent a few days at the beach. It was a special time this year as I had the chance to be hosted by the delightful team of Forte Village in Sardinia with my best friend Fiona, who also works part time with us, the Kayteam. I’m used to cover myself up with tons of clothing. But this time it was the perfect occasion to slim down, work out and be as healthy as positive while hanging out on this absolutely gorgeous Italian beach (where by the way, each girl seemed to be 20 times prettier than the one you’ve seen before). Before heading to Forte Village, not only did I do a juice cleanse, I also avoided all carbs (not so hard with the gluten intolerance) and sugar. In terms of work-out, I enjoyed doing some pilates and regular exercises : squats and planks are fantastic. My goal was to be “naturally” fit. Not too much, but still sleek and slim. Owning the bikini is a whole art and there’s definitely an incredible lifestyle that goes behind it, which I am actually also fascinated by. I felt absolutely in love with my new Victoria’s Secret one piece swimming suit. It really reminded me those old school bikinis that pin-ups used to wear. Paired with some Céline retro sunnies, it seemed like a perfect match to add a fun twist to this look. Fiona and I had the times of our lives at Forte Village. It is such a peaceful and incredibly relaxing destination. The beach : a pure oasis of peace and tranquility being disturbed if only by a guy who yells “Cocco bello, cocco fresco!” every 15 minutes. Which, I mean, is totally okay as i absolutely love fresh coconut! Also, can’t even describe how amazing it was to be able to be there with my book Fiona. As we work together most of the time, it was so awesome to spend some leisure time together, have endless conversations about life, society, values, ambitions, dreams. Anything. But we would also be speechless and completely silent in front of the beauty of Sardinia and right before passing out on the beach every single day. 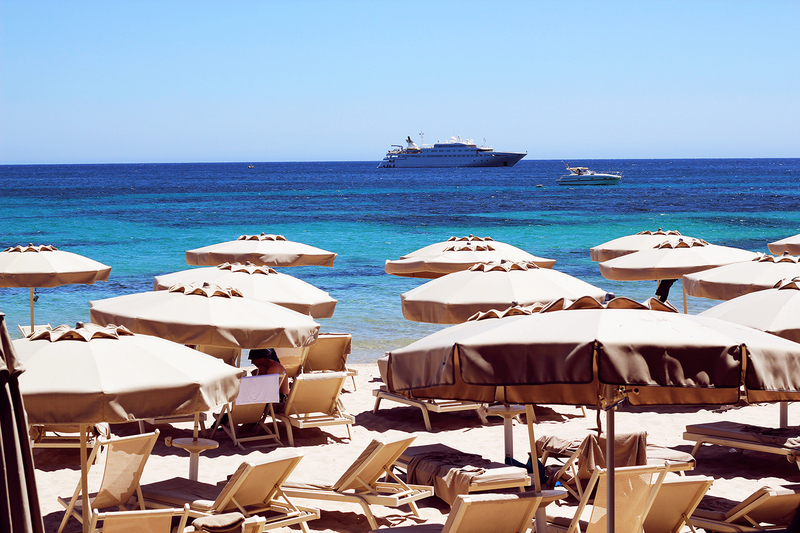 Forte Village is definitely a hidden paradise in the middle of Italy. Wow this beach is like paradise, the sea is so beautiful and you look really amazing with this chic swimsuit. You look like a mermaid, such an enchanting photos! Kristina! Qué ganitas de playa me estás dando, se está tan feliz, tan relajado, tan a gusto... Me encata esta playa que nos enseñas, es muy muy bonita y también lo es tu bikini, estás guapísima! You are working that one piece! You go girl! you 've managed to build an amazing body - congrats!!!!! awesome pics! The water looks amazing! You look so amazing!! Really really gorgeous!! Love all these pictures and all the happiness and goo vibes that you spread with them, it looks like you are in paradise!! Stunning! Love the swimsuit and the sunnies a lot! You look beautiful. Come to Australia, we would love to have you visit! Lovely bathing suit! It's os gorgeous! Just a paradise ! Gorgeous bikini. You look so amazing in that bathing suit! And the sunnies are gorgeous! miss the beach and the ocean so much. Tu es trop parfaite ! Comme la vie peut être injuste. La plage et le soleil... Voilà un vrai été, loin de la grisaille en France. Tout est sublime sur ces photos (comme toujours!) et ça donne vraiment envie de visiter la Grèce. you look amazing!! would kill to have those legs!! I love the model of the swimsuit, but black color makes you look too old..
You are totally right, we stayed several times in Sardinia and we love it! It's so beautiful and we had the possibility to visit it from north to south and it's really different, but all the areas are like paradise in heart! beautiful photos. looks gorgeous there! I love that one piece!!! Amazing photos! The bikini is really lovely! Great shots, as well. This makes me go to the seaside desperately! The classic look suits you amazingly! Wow! These photos are incredible! You look stunning! You look gorgeous! That looks like an amazing beach. I wish i lived near a place like that! That's so awesome, Kristina! It's always great to have friends you can be with and talk about anything with, especially dreams. Your friend is blessed to work with a creative mind like you and I'm sure you feel the same with Fiona too! Looking forward to your next post! P.S. I tried the Dior Rose lip balm and it's my new favorite that I wrote a blog post about it! Thank you!!! I'm jealous!! I've been wanting to go to Capri, Italy so bad. Sardinia looks beautiful! I love your swimsuit Kristina! I do miss my holidays as well in Croatia .. Gosh ! Those pictures are fantastic ! Damn, I'm in love with that place. I wished I lived there! You are adorable and so chic in that swimsuit! 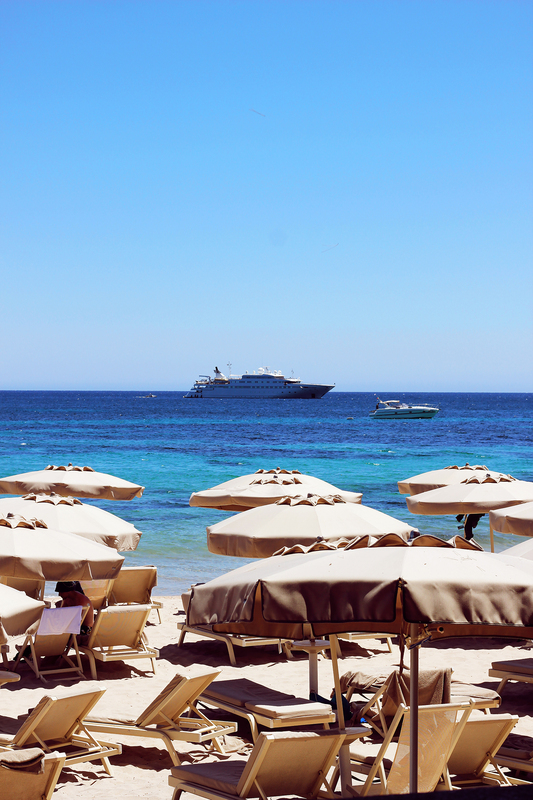 I agree, Forte Village is heaven on Earth! I am glad you enjoyed your detox vacation, I will be in Sardinia next week! Can't wait! Schöne Fotos die Lust machen auf Ferien am Meer. love this post Kristina! great shots at the beach and love the swimsuit! The photos are perfect, this swimsuit is wonderful! Love your bathing suit and these photos are so beautiful! I totally agree with your thoughts on summer! You're in a beautiful shape - and love the Cartier necklace with the swimming suit! the sunglasses are so beautiful!♥ lovely pictures! Amazing and very summery pictures! Love the view of the sea! What a dream day! LOVE the sunnies...celine shades are always endlessly classic, all of mine I still bring out once a week!! Looks like a terrific trip. Looking so hot and gorgeous!! Incredible! love the beach! And you seem you do too. Sunglasses are god! Love them! You look stunning. Currently working on my bikini body... again! and slimming down whilst attempting to not build too much muscle! It's hard work! Stunning ! Your hair omg !!! Always loved the beach, I hope you had fun! I went to Sardinia many many years ago (I guess it's about 16 years now) and I even remember that I loved it back then. Such a beautiful island with so many beautiful beaches, restaurants and other places to relax. Love the photos and the look! You look so relaxed and pretty! Vas-tu poster de nouvelles photos de Sardaigne? Cette destination me fait rêver! These pictures are absolutely gorgeous! I always find it difficult to shoot in direct sunlight, but you pulled it off beautifully! I also love the swimsuit, really suits you! j'adore ce maillot! drôle comme les modes vont et viennent,il y a quelques années, on ne m'aurait fait porter 1 une pièce pour rien au monde! Congrats on winning bloglovin award !